Searchudak.com is a browser hijacker that changes your default search engine into http://Searchudak.com/ and uses the results of www.yahoo.com. Its exterior can be deceiving because at the first glance it looks like your regular search engine. It comes bundled with other malicious programs like WNet, ActSys, CashReminder, and GOSafer. Although its server is located in Netherlands, this fake search engine has mainly attacked Brazilian users and its texts are written in Portuguese. The provided search results are also mainly in Portuguese. However, it can attack any browser – Google Chrome, Mozilla Firefox, or Internet Explorer – no matter the language you speak. Searchudak.com virus replaces the homepage of your web browser without your permission, so do not hesitate and remove http://Searchudak.com/ as soon as possible. We are sure that you don’t want to have a search engine that hacks your browser and is very difficult to get rid of. How did I get Searchudak.com? Like the majority of browser hijackers, Searchudak.com can sneak into your computer while you download various freeware and shareware programs, for example, video recording software or PDF creators. Searchudak.com can be mainly obtained from Brazilian websites that contain pirated content. Our security experts advise you to never download or open any unreliable software or links. Also, you should never be lured by ads that you see on the Internet – they can usually bring only viruses to your computer. Delete Searchudak.com virus immediately in order not to get infected with even more malware. Searchudak.com removal is the thing that should consider you the most if you were attacked by it. Your browsing experience will be completely ruined because the browser hijacker will mix up the results. The user can be redirected to various unrelated websites which can bring other malware to their computer. Not to mention that the search engine is very poorly optimized. Our research team strongly suggests you to uninstall Searchudak.com browser hijacker because it alters your search results. Your browsing results will get blocked by many unrelated links and advertisements that you must not click. The main objective of Searchudak.com is to generate as much money as possible and it collects money via advertisements. That is the reason of the abundance of ads that will make it difficult to use your browser. Delete Searchudak.com virus if you don’t want to make profit to hackers. 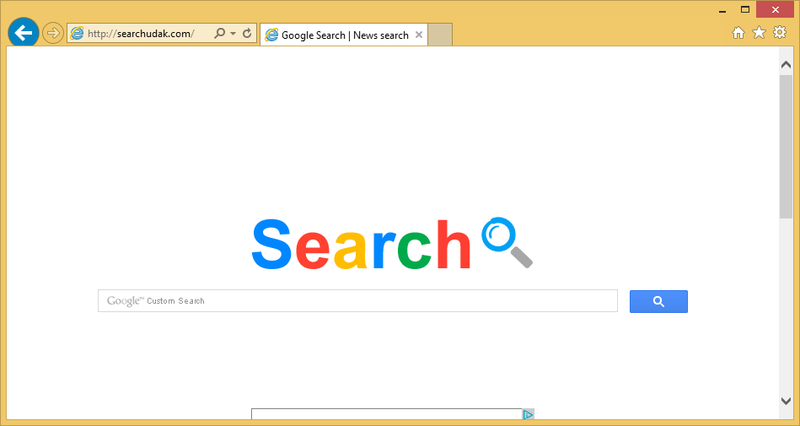 Finally, this browser hijacker is capable of collecting your personal information like search queries, e-mails and banking information, so please eliminate Searchudak.com search engine now. How to remove Searchudak.com from my computer? It is a tough task to remove Searchudak.com virus from your computer. The usual ways such as doing this via Control Panel or modifying the browser’s target line are not enough. Firstly, you have to uninstall ActSys, CashReminder, GOSafer, and WNet. Then, you must locate the Drivers Folder in System32 and delete files named crfilterdrv.sys, gosaferdrv.sys, asfilterdrv.sys, ssfilterdrv.sys. Only then you are capable to change the homepage. If all of this sounds too difficult, we advise you to do this automatically with a trustworthy anti-spyware and anti-malware tool Wipersoft. It will not only save you much time, but will also protect your computer in future.